Photographer Anders Edström in conversation about a place that disappeared while he was watching. 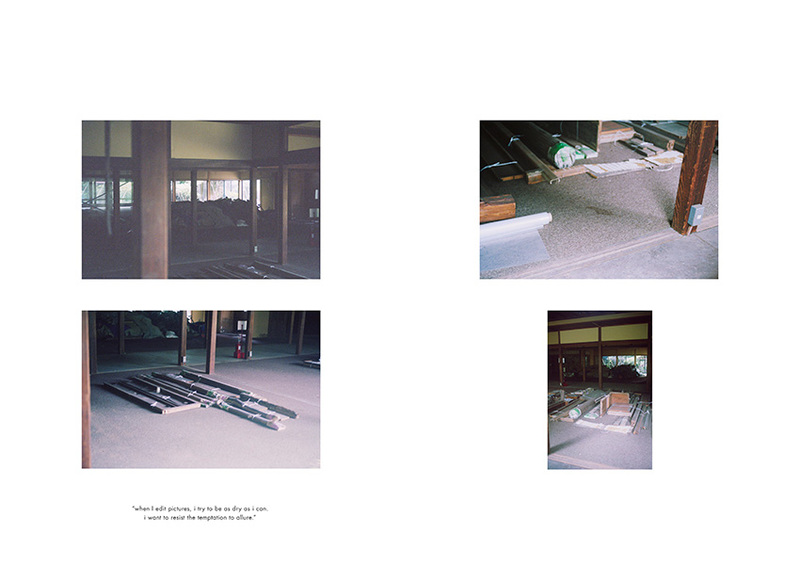 Turning the pages of Hanezawa Garden, the latest book by Swedish photographer Anders Edström, is like watching a movie with a bad ending. Images in similar formats, horizontal or vertical, frame a scenery (mainly architecture, various objects and plants), that transforms and almost vanishes as we arrive at the last picture. It is also like watching a movie where nothing much happens. Even though the book is structured around continuous stages of decay, there is no obvious narrative in the Hollywoodian, psychologic sense of the word. In Hanezawa Garden the juxtaposition of pictures on a spread, and the series of spreads, create a movement – forward, if we start watching from the beginning – and minimal shifts in camera angles produce a sense of change. But other than that nothing much happens, except for that it does. Put together, the pictures chronicle the process of demolition in seven years of a cultural heritage in the Shibuya neighborhood of Tokyo. Originally founded by a former railroad minister, Yoshikoto Nakamura, in 1915, the garden had several owners over time, until its destruction in 2012. Despite the resistance from a group of local residents, the garden is now replaced by Mitsubishi Estate with an apartment building, set aside some trees. Why did you take an interest in Hanezawa Garden in the first place? I lived on the same street and one evening I went for dinner at the restaurant in Hanezawa Garden. After dinner the customers could visit the garden and in the main house there was a cigar bar. The next time I went there I was with my daughter. I had just picked her up from nursery school. Both the restaurant and the garden were closed. It was forbidden to go inside but we found an entrance at the backside of the garden. It wasn’t meant for anyone to enter but out of curiosity we did it anyway. I took some pictures at random, and some days I returned to take some more, but it was not until years later, when concrete plans to demolish the place were made, that I started to take it more seriously. The work to tear down the garden stopped when some local residents, together with cultural workers, formed a preservation group. During this time, for several years, I kept climbing in to photograph the garden and the houses in there. When the preservation group lost the battle I decided to make the book. It was never my intention to just make pretty pictures of a historical site. The process of decay going on in Hanezawa Garden, does it have any symbolic meaning outside the local context? Do you think of decay as a subject in itself, an existential issue? Yes, I do. But while I take pictures I simply record what I see. I am just looking at the surface of things. That’s what I like about photography. To just show things as they appear. Things change, inevitably, and I want to expose that too. My pictures show the passing of time in the way they are edited. When I do a series of pictures, it might take half a day, one hour or several years, as with Hanezawa Garden. In the edit I often play with the sense of time. Sometimes I slow it down and sometimes I speed it up. Often when I look at your pictures, I feel as if time has stopped. The way you are zooming in on a leaf, for example. It creates a sort of lapse in time, a meditative moment or even a state of trance. Yes, I experience that a lot. Especially when I take pictures. I often find something that interests me while looking intensively at an object. Mostly it has to do with color, shape and light. Something that I personally find visually attractive. Then I go back and look at it again. And again and again. It is a spiral process, which includes repetitions and many retakes of the same thing. I’m trying to dilute the image. To make it weak. I find that pleasing. Automatically, it creates a wide range of pictures taken at various times, different seasons, different light. To me that is enough. The end result might be hypnotic, but I don’t search for deeper meanings. Does it matter what kind of objects you are looking at? No. I am trying to look at everything in the same way, whether it is a street, a building, an object or a person. I am interested in the surface. I am not trying to convey a mood, capture a personality or tell a story. It is mainly about composition. The way I combine materials or colors, for example. Or the way I use depth of field. Generally, I am drawn to things that are close to me. When I first started to take fashion pictures, I thought they had to be glamorous, but after a while I felt that I wasn’t being true to myself. I set up some rules to deal with clothes in the same way as I was dealing with other subjects. I wanted the camera to record what I saw, without emotional commitment or complicated angles. Perhaps it wasn’t the most spectacular pictures, but that was never my intention. On the contrary, I have always been more intrigued by the ordinary. A resistance to the idea of the single perfect picture, the master piece? Yes. Usually, I am standing straight up, and then I want the picture to be taken from that viewpoint. I am not trying out different angles to create drama. I want it to be as detached as possible rather than emotional. I don’t like when the camera is used to provoke specific feelings. When I edit pictures, I try to be as dry as I can. I want to resist the temptation to allure. I sometimes like to include a couple of classically beautiful pictures but I need some sort of disharmony or dissonance. That makes it more beautiful to me. 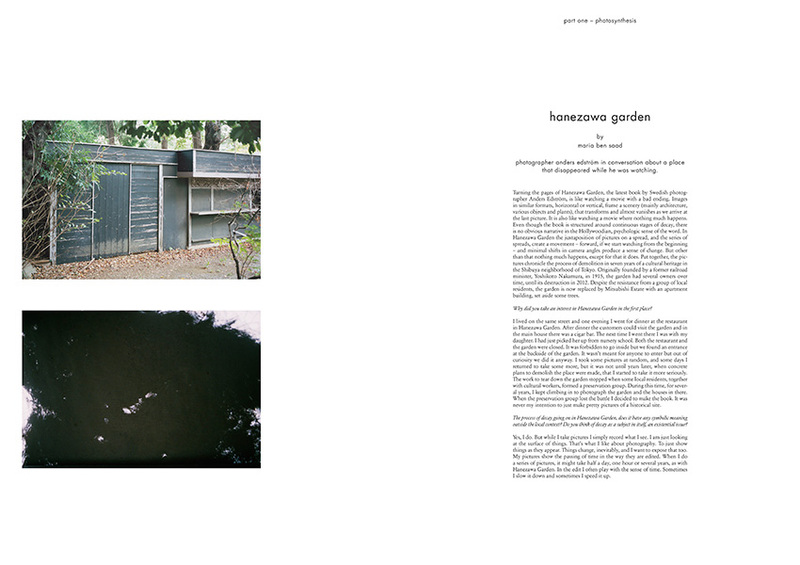 Hanezawa Garden was published in November 2015 by MACK. Previous monographs by Anders Edström include Waiting Some Birds a Bus a Woman/Spidernets Places a Crew (2004) and Safari (2010). He also does fashion stories for a number of international publications. This interview was first published in our “Nature as Culture” issue in 2016.